Hope you've enjoyed the storm coverage tonight. Here is where things stand at 10:35pm CDT. 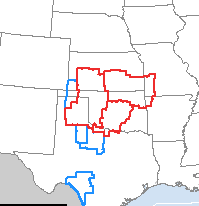 Tornado watches (red) continue in effect in the outlined area. Severe thunderstorm watches in blue. Tornado warnings (purple polygons) in Kay Co., OK continue in effect. The rest of this large area of orange-red echoes has the potential to cause strong to damaging winds as they move east...possibly becoming ESE as the next few hours progress. 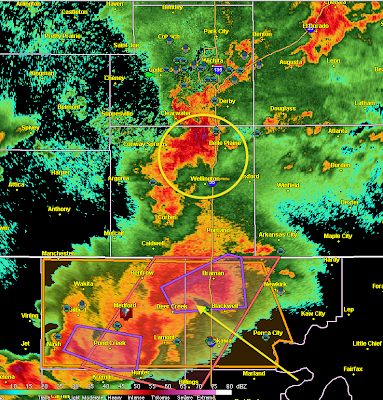 Radar has indicated thunderstorm-generated winds of 80 mph places. This may continue. 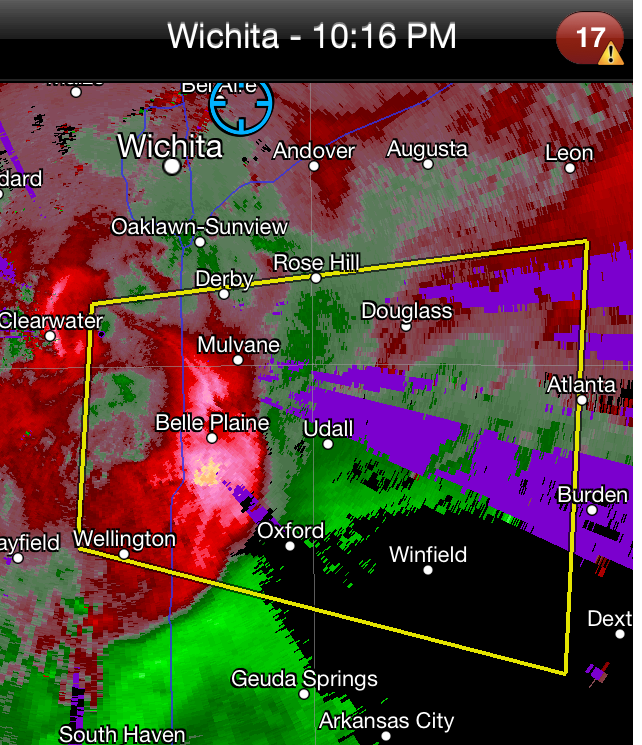 The orange area south of Belle Plaine, KS is the Wichita Terminal Doppler Weather Radar sensing winds of more than 80 mph! 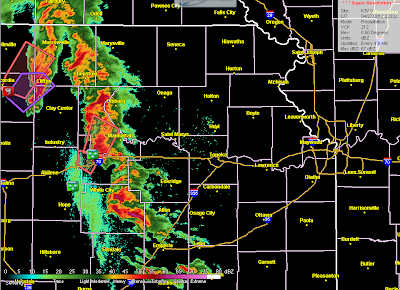 This area will move rapidly east into Cowley Co. the next 45 minutes. 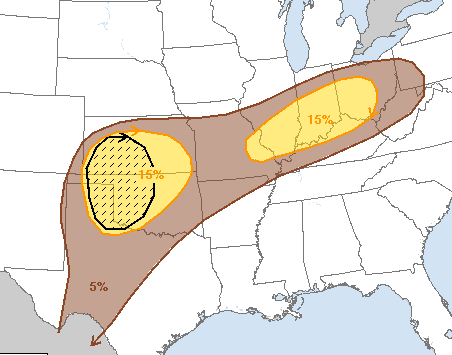 Be prepared for damaging winds in the yellow polygon. 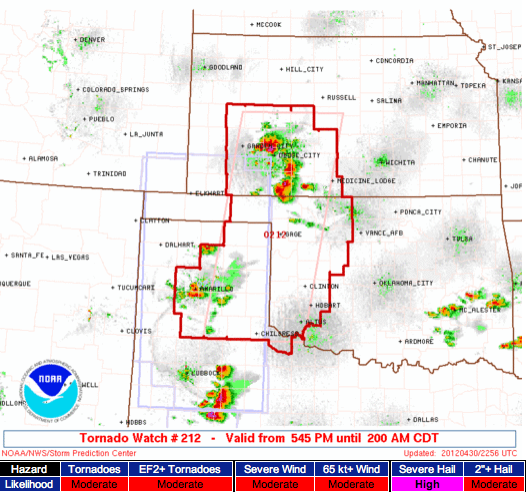 This tornado watch, until 2am, includes Oklahoma City, Norman, and Wichita Falls. Radar at 10:09pm shows damaging wind potential in the area outlined with the oval and a tornado near the tip of the arrow. 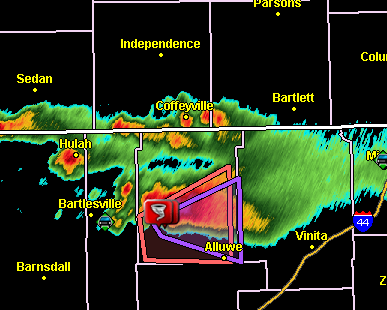 The purple polygon is the tornado warning for Kay Co., OK.
Tornado on ground near Deer Creek, OK moving across I-35 toward Blackwell. There is a report of "major damage" in Medford. This is the easternmost arrow. Tornado moving E to ENE. There are other tornado signatures at the two western arrows. The oval is an area of developing damaging winds moving east. Update 9:35pm. Report of "major damage" 1 mi. west of Medford, OK.
Two areas of concern at the moment. A tornado is likely occurring at 9:29 at the tip of the arrow. 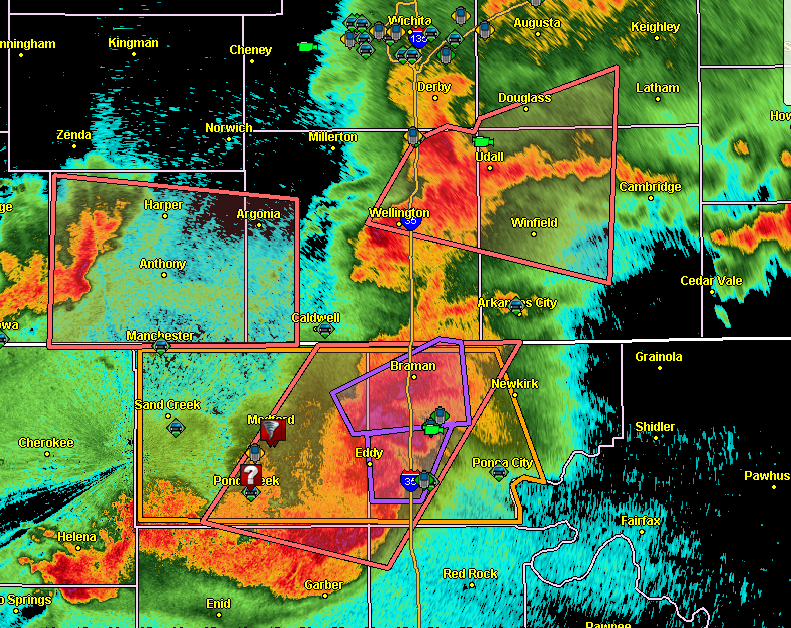 This is just northeast of Medford, OK. 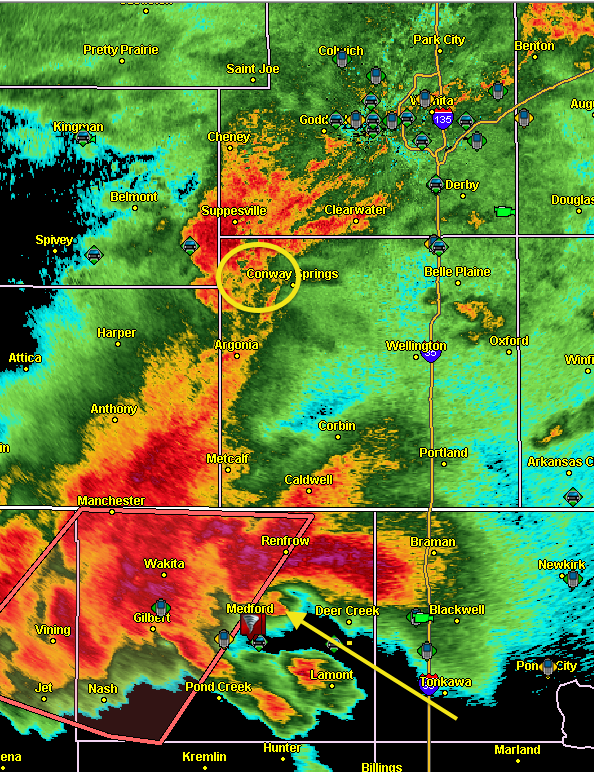 There is also a little rotation at the oval near Conway Springs, KS. This bears watching. 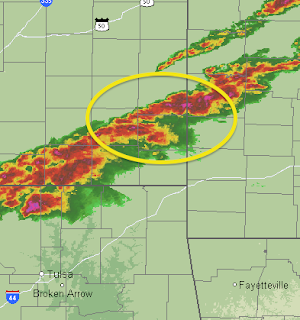 Tornadoes are indicated at each of the arrow locations at of 8:39pm CDT. Here is the AccuWeather regional radar. 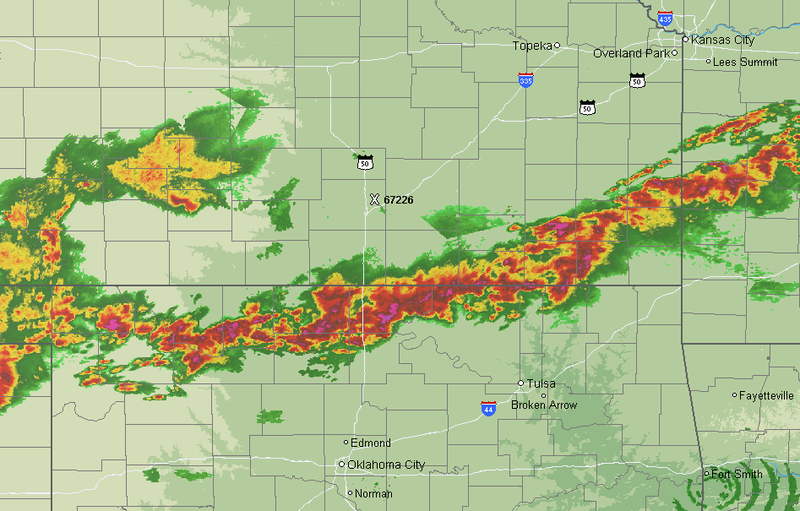 The storms along the KS-OK border are especially dangerous at this point. Also, the storms between Amarillo and Childress in the Texas Panhandle may have very large hail. 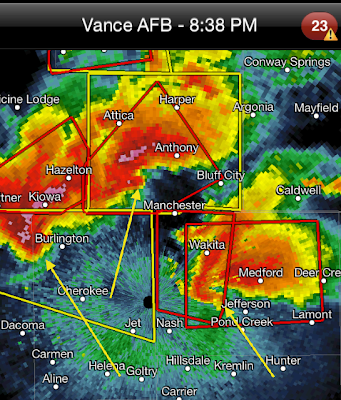 Two areas of tornado warnings as of 8:24pm. 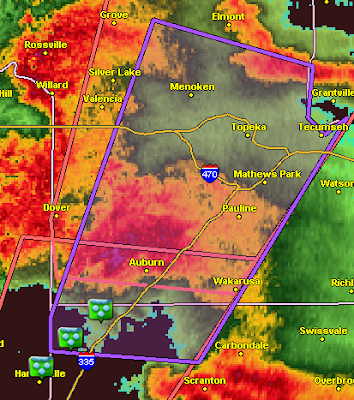 Tornado warnings = purple polygons. The upper image is the Kansas-OK border area. The lower image is east of Bartlesville. Pronounced hook echo near Joy, heading in the direction of Greensburg at 6:39. 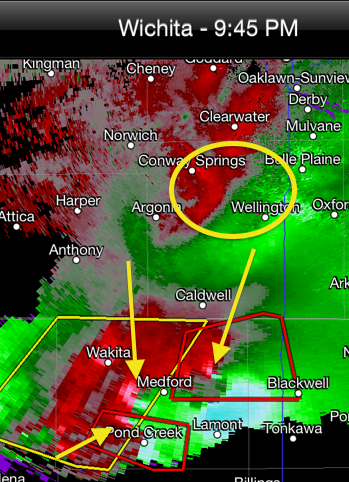 Three areas of Rotation indicated by arrows. 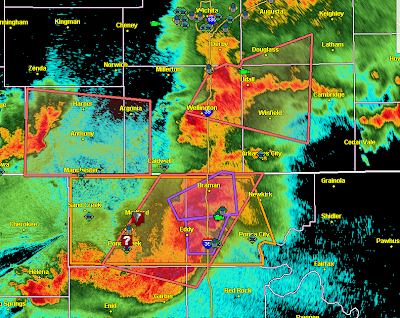 issued as far east as Pratt Co.
southern Kansas throughout the rest of the evening! 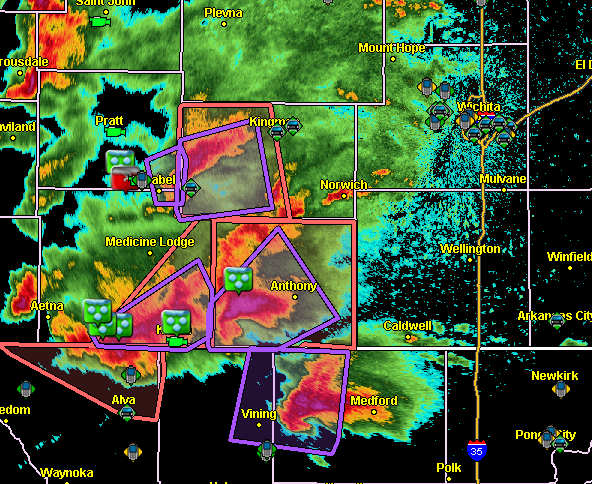 UPDATE AT 6:36pm: Tornado warning for Greensburg and Kiowa County. New tornado warning farther south for Protection, Coldwater and Buttermilk. 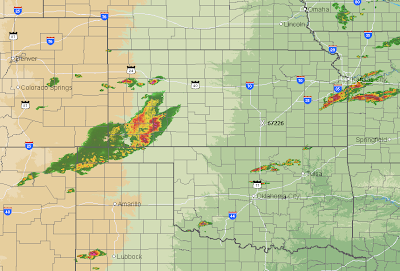 AccuWeather regional radar shows a strong cluster of thunderstorms from near Dodge City into the Gyp Hills of south central Kansas. They are moving and growing toward the ENE and NE. 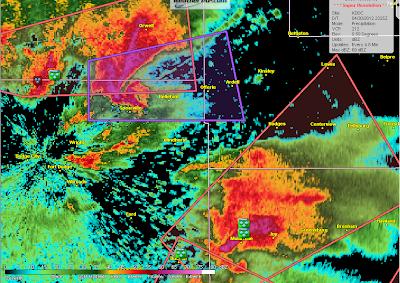 A tornado warning (purple polygon) is in effect northeast of Dodge City. 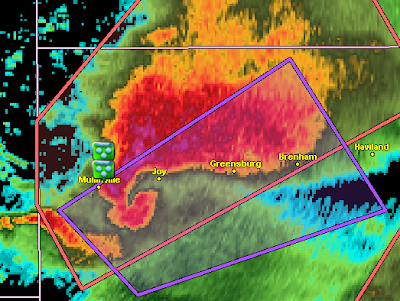 A hook echo may be forming WSW of Greensburg. 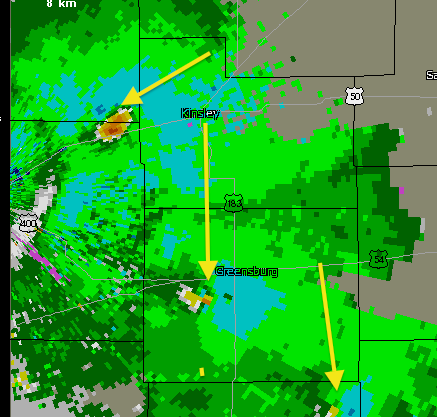 Residents of Greensburg and Kiowa Co. should monitor this storm as it approaches. Note: Last blog entry for the evening. Funnel clouds have already been reported in the Dodge City area. The watch is in effect until 2am CDT. People in these areas should monitor the latest information as the thunderstorms move ENE. A flash flood watch is in effect through tomorrow morning in the green-shaded areas. Is The Kansas Highway Patrol Targeting Storm Chasers? It shows storm chaser Jeff Piotrowski stopping alongside a Joplin police officer pleading that the sirens be turned on -- they had been off -- as the F-5 tornado came into the city. 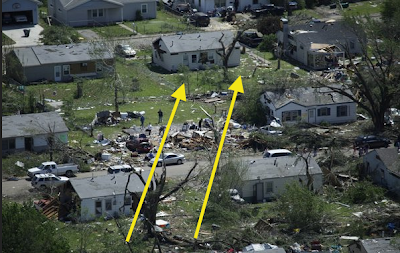 Joplin emergency manager Keith Stammer, at the NWS's WeatherReady Nation meeting in Norman, OK in December, acknowledged that this report was the reason the sirens were turned on as the tornado moved into the city. This tornado, as I explain in my soon to be released book about the Joplin tornado, was completely "rain-wrapped" and invisible along its eventual path. Question: Given that 161 died in Joplin, how many more might have died had the sirens not been activated as the tornado approached? As least some of the people who survived may well have a storm chaser to thank. Second question: If a tornado is approaching your city, do you want a qualified storm chaser there to send reports to the National Weather Service and law enforcement? I would answer "yes." Apparently, the Kansas Highway Patrol (KHP) answers, "no." But, considering storm chasing is a completely legal activity, is KHP acting properly? 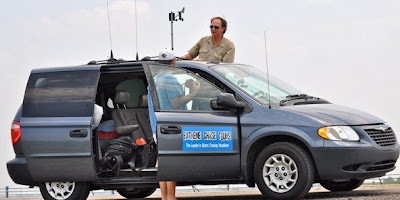 Friday, Lanny Dean and other storm chasers (seven as far as I can determine) were pulled over by the Kansas Highway Patrol in different parts of the state and lectured about what the officers perceived as the downside of storm chasing. The pretext for pulling over Dean, just inside the border at Coffeyville, was that he had "tinted windows." As you can see in the photo above, his windows are tinted but they are the original factory tinting which is perfectly legal. Lanny, after being stopped for an extended period of time, was not cited for any violation. As I have previously stated, several times, I'm all for law enforcement ticketing chasers (or anyone else) who drive poorly or violate any other law. 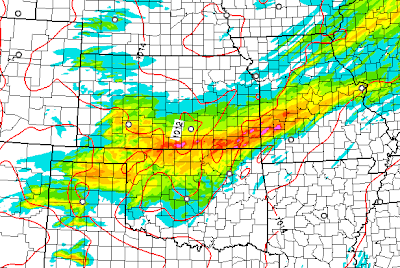 Some of the chasers were ticketed Friday and that is fine with me. But, it appears most were not. That concerns me. Targeting and/or harassing people involved in a perfectly legal activity? That appears to be contrary to the law enforcement Code of Ethics. I called Kansas Highway Patrol headquarters in Topeka and spoke with public information officer Lt. Josh Kellerman. He stated he "didn't know" whether chasers were being targeted. I'm hoping Friday was an anomaly. We should want experienced, responsible chasers to keep an eye out for storms and helping the warning process keep people safe. 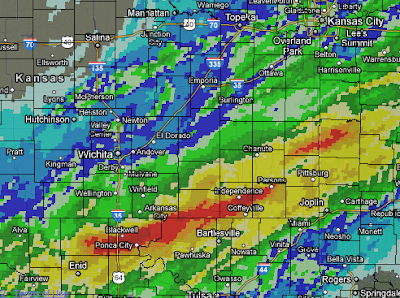 The darker red is ten inches of rain in the last 30 hours. Red is eight inches. Flooding is occurring in some of these areas and some streams will not have crested yet. Maroon = flash flood warning. Greens = various types of flood warnings. Update via Timothy Bradfield, 9:40am: Major flooding...trying to get pictures..will have them here on my fb page....water rescues in Tonkawa last night....numerous stranded vehicles in Blackwell and Ponca City...It was a complete mess..and I am afraid that it will just get worse later with more storms. This award-winning documentary gives good insight into what storm chasing is really like. 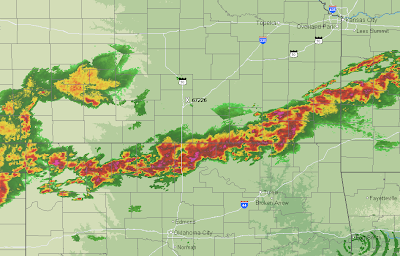 UPDATE: 11:08PM, Threat of flooding increasing with line of thunderstorms near Kansas-Oklahoma border. Radar indicates that already three inches has fallen in spots. Given the earlier heavy rains, this is more than enough to cause flooding. Some flooding has already been reported in Ponca City, OK.
UPDATE: 10:20PM, flash flood warning already issued for the areas circled. 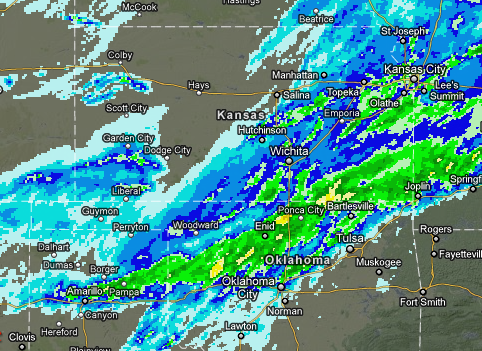 As much as 4" expected in southern Kansas. Now, don't take this too literally...this can shift 30 mi. or so in any direction. However, flooding is especially dangerous at night..and given the saturated ground there will be areas of flooding late tonight and tomorrow morning. Click to enlarge. 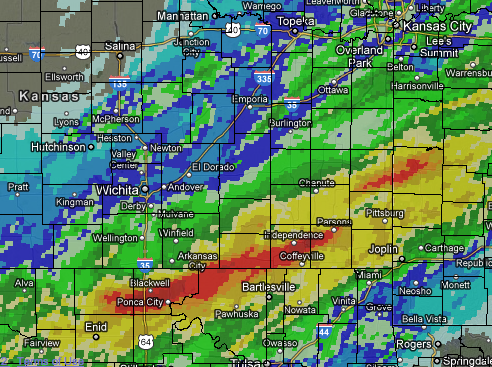 Some areas received 2.5" inches (yellow) of rain or more. Some of these same areas may receive heavy rains overnight which raises the potential for flooding. 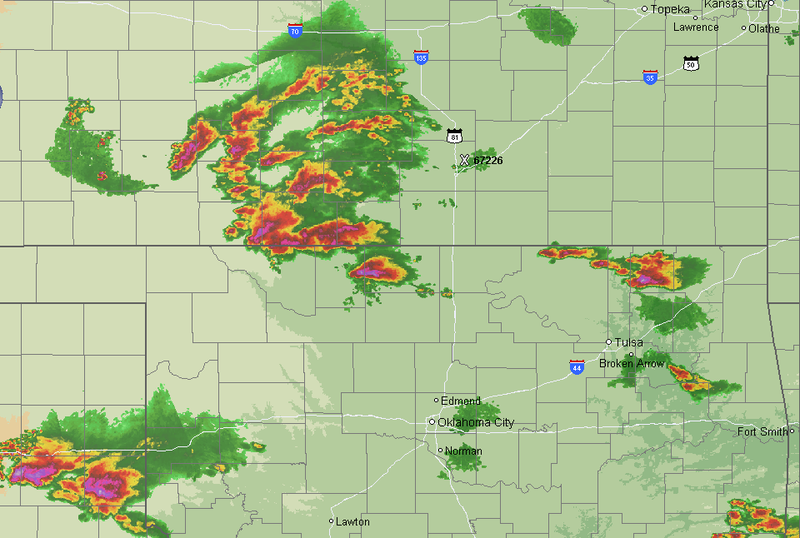 AccuWeather Regional Radar at 9:35pm shows strong thunderstorms southeast of Dodge City and across northern Oklahoma. 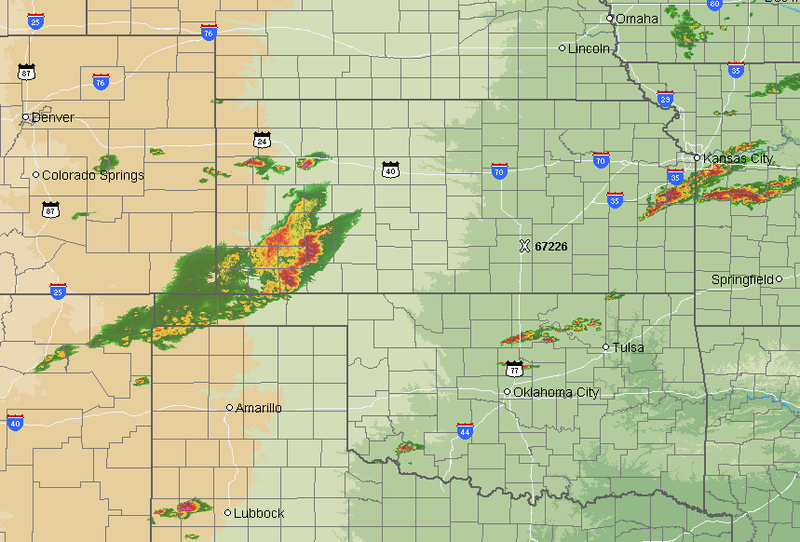 The Oklahoma storms are migrating to the north. 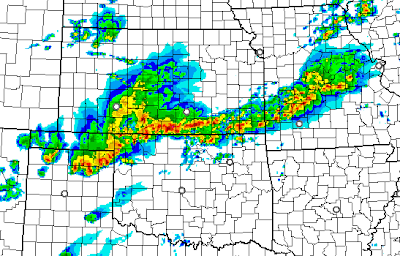 By midnight, I expect strong storms to be located between the Oklahoma border and U.S. 54 with very heavy rains, areas of hail and high winds, and a slight chance of a small tornado or two. 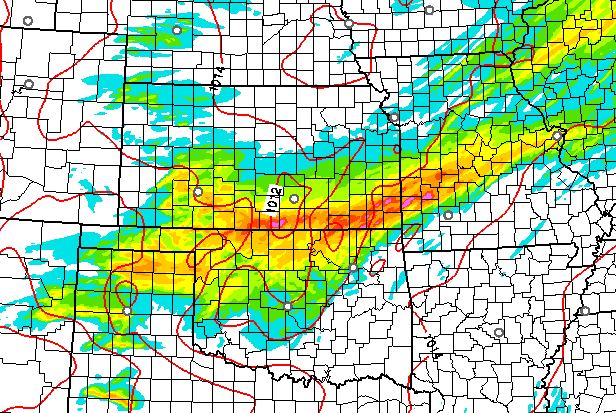 Above is an experimental radar forecast for 12 midnight. 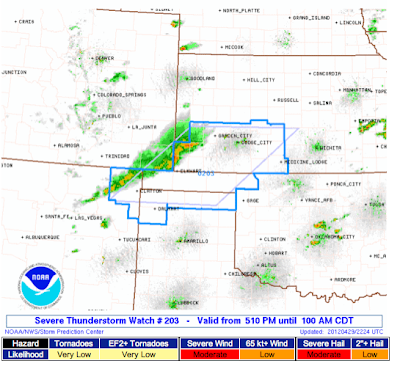 Strong winds are also possible with the storms in the Texas Panhandle and northwest Oklahoma. 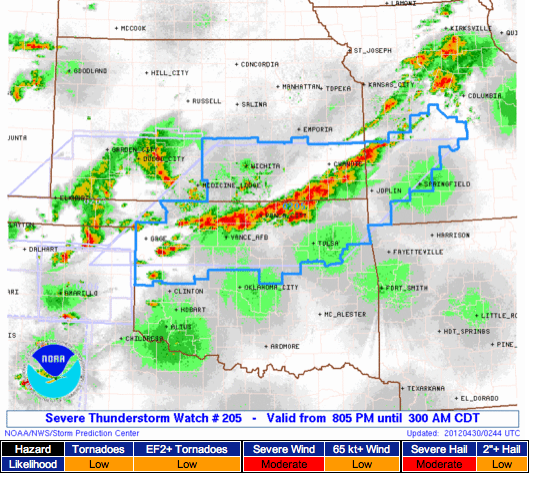 The severe thunderstorm watch continues for the region until 3am. This will be my last update for the night. Thanks for reading! As expected, here is a severe thunderstorm watch until 3am for parts of Oklahoma, Missouri, and Kansas. 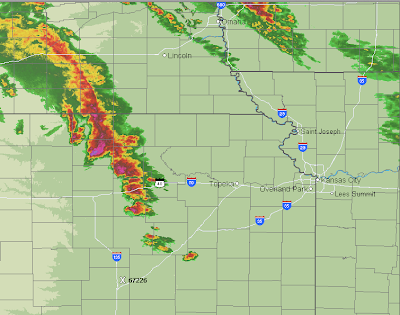 Winds to 70 mph and large hail are expected. 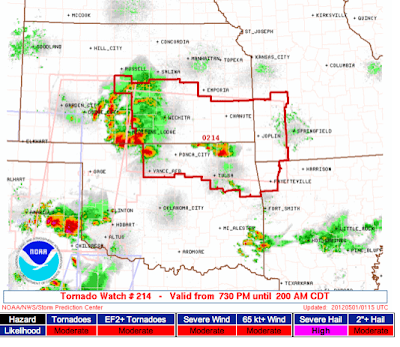 Wichita, Tulsa, Joplin and Enid are included. AccuWeather regional radar at 8pm shows three areas of thunderstorms. I have added arrows indicating the direction of movement of the storms. A derecho is a long-lived storm complex that can produce damaging winds, large hail, and occasional tornadoes for hundreds of miles. There are some indications that one might form tonight. 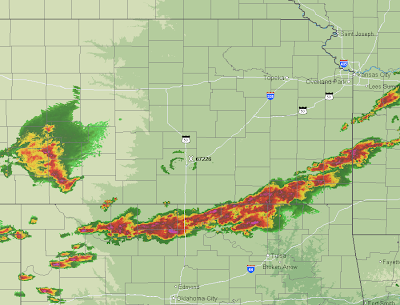 AccuWeather regional radar shows a strong complex of storms over southeast Kansas moving east. There has already been one report of 70 mph and a second report of 60 mph from those storms in the southwest part of Kansas. 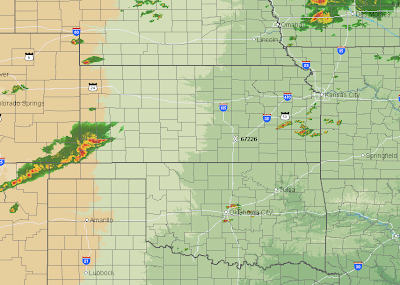 Scattered thunderstorms are developing south of Kansas City and north of Oklahoma City in the very unstable air over the area along and east of I-35. 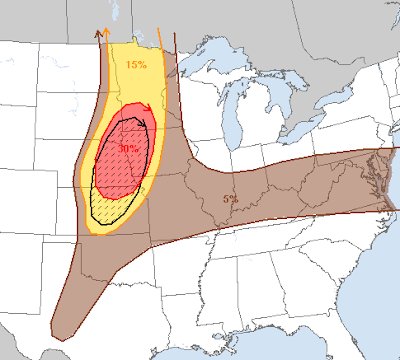 Computer guidance shows the statistical chance of derecho forming in 3-4 hours is fairly high. 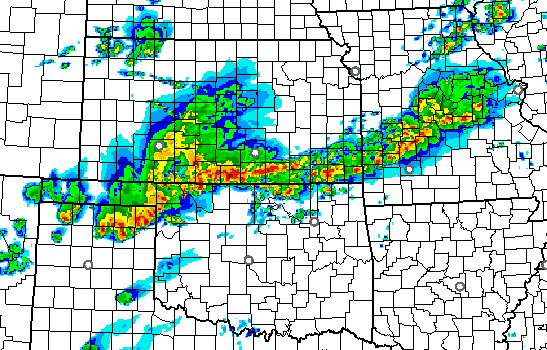 If that occurs, damaging winds and hail are possible. So, I'd put the car in the garage if you are in the area outlined below and bring in lawn furniture and things that can be easily blown about. I'll blog about this at least one more time this evening. Two Questions: "When the Sirens Were Silent"
The first question I received this afternoon is "Will When the Sirens Were Silent be on Kindle?" and answer is yes. It will be on both Kindle and Nook and, perhaps, the other two formats. However, I don't have a date yet but we'll move it through the system as quickly as possible. Here is more information about each of the appearances. Please note I always vary the presentation so it specifically tailored for the interests of each audience. Greensburg, Kansas is this Saturday, 10:30am. Details here. I will be discussing how the warnings of the Greensburg tornado five years ago saved more than 230 lives, what we have learned about tornadoes since Greensburg and how the warning system did not function as well in Joplin. Kansas City, Missouri will be at the main Library with the reception starting at 6pm and the presentation begins at 6:30 on May 9. 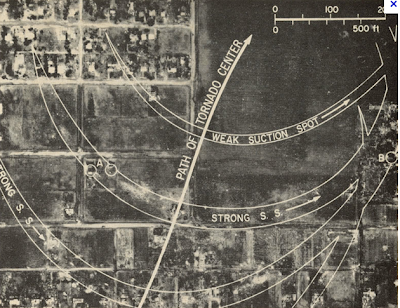 I'll talk about the Ruskin Heights Tornado (55 years ago) and how it played a key role in the future of the warning system and about the Joplin storm. Full details here. Wichita, Kansas at Watermark Books, 7pm, May 10. Details here. In addition to discussing the Joplin storm, two survivors, Denise Neil and Jaime Green, will join me to give their first-hand account of that harrowing experience. 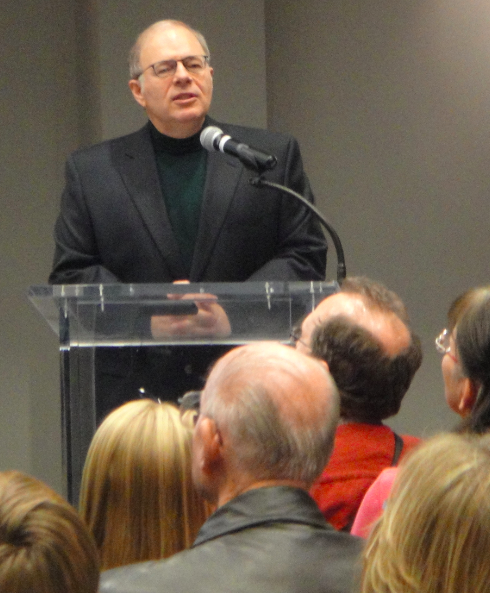 Joplin, Missouri will be at the public library the evening of Thursday, May 19. We are still working out a couple of details and I'll have more shortly. We are working on additional dates in additional cities. 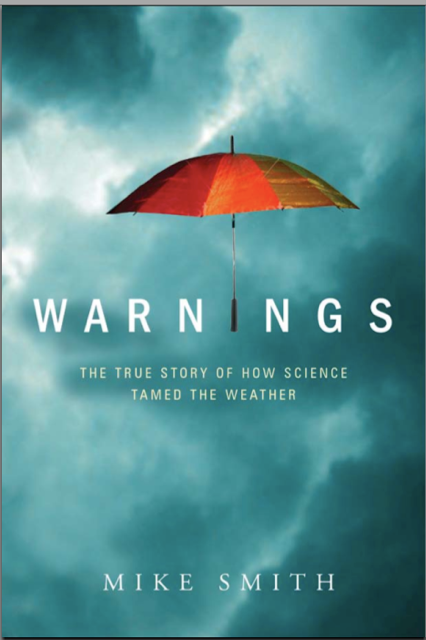 Both books, Sirens and Warnings: The True Story of How Science Tamed the Weather will be on sale at all events and I'll be happy to sign them regardless of whether you purchase it at the event or already have a copy. AccuWeather regional radar shows the line of thunderstorms in the High Plains that will be strengthening as it gets into the more unstable air to the east of U.S. 183 this evening. 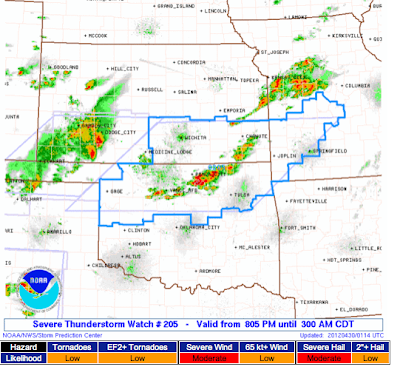 This may be one of those events that keeps going much of the night, so people to the east of the watch should keep an eye on the weather later this evening and check in with their 10pm newscasts. Tuesday's probabilities are fairly high for this far out. This certainly bears watching. Thanks for the Book Orders! Amazon -- finally -- has Warnings: The True Story of How Science Tamed the Weather back in stock. However, I suspect there were books on back order as they are already back down to 17 copies. "My wife Patty and I both recently finished reading your book 'Warnings' and I just wanted to let you know we both really enjoyed the book. It was a really easy read, but more importantly, highly informative and extremely interesting!" We have received the first orders for When the Sirens Were Silent -- from as far away as Maine -- and we certainly appreciate them. Thank you. We are told by the publisher that we will have books in hand on Tuesday. If correct, we will have them in the mail no later than Wednesday. Of course, we will immediately start working with Amazon, Barnes & Noble, Books-a-Million, and others to get the book into their distribution systems. It is unknown how long it will take for Sirens to show up on bookstore or even Amazon's shelves. So, if you want to have sure to have copies available for a Mother's Day or graduation gift, please order either book directly from us. Here are details. Prices include shipping and sales taxes. I'll happily autograph either or both and, if the book is a gift, write whatever inscription you would like. The check should be made to: Mike Smith Enterprises, LLC at 4031 N. Tara Circle, Wichita, Kansas 67226. The haunting organ. The violins recreating the sound of wind in the wires. Glen Campbell's superb vocal performance. Released in October, 1968, Wichita Lineman is one of the great songs of the era. Tonight, Mr. Campbell will perform at Wichita's Orpheum Theatre on a stop on his "Goodbye Tour." The performance is sold out. As he has announced, he has Alzheimer's Disease and this will be among his final public performances. The Wichita Eagle has an illuminating article about the song and tonight's performance here. Noted 'climate scientist' Tim McCarver, former MLB catcher, opined during yesterday's Fox Sports broadcast of the Cardinals' game that climate change was causing more home runs and that climate change had help two balls fly out of the park during yesterday's game. As usual with these types of comments, McCarver was mistaking weather for climate. Shortly after the game, violent winds struck the ballpark, collapsing a tent. One person was killed and 120 injured. Details from KMOV TV here. Too often, we unnecessarily lose lives due to weather in the United States. We would be far better off diverting some of the excessive funding of global warming studies into making sure our weather warning system is as robust as it can reasonably be. I went to a Rotary Club mixer recently and was asked about this photograph by Mike Hutmacher of the Wichita Eagle. "How could that one house have been destroyed?!" The two most likely explanations are that the house had a construction flaw that was not present in the surrounding homes. Or, a "suction vortex" struck the house or both. Here is an explanation of the phenomena. Many larger tornadoes have multiple, smaller vortices (originally called a "suction vortex" by their discoverer, Dr. Ted Fujita) that rotate around the main funnel. The winds are stronger in those smaller vortices than in the main tornado. Looking at the tree slightly left of center in the lower foreground, it is more beat up than the trees on either side. It is possible a vortex hit that tree, passed between the two homes then hit the collapsed home head on. There is a second tree behind the destroyed home that is also quite beat up. The vortex (they are short-lived, just seconds usually) may have weakened beyond that point. Dr. Fujita used to plot the path of these vortices in his damage surveys. Without doing an engineering study (paging Tim Marshall), the cause cannot be determined. But, I wanted to offer some plausible explanations. 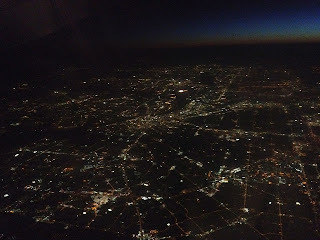 Took this photo of Dallas at night Friday evening. 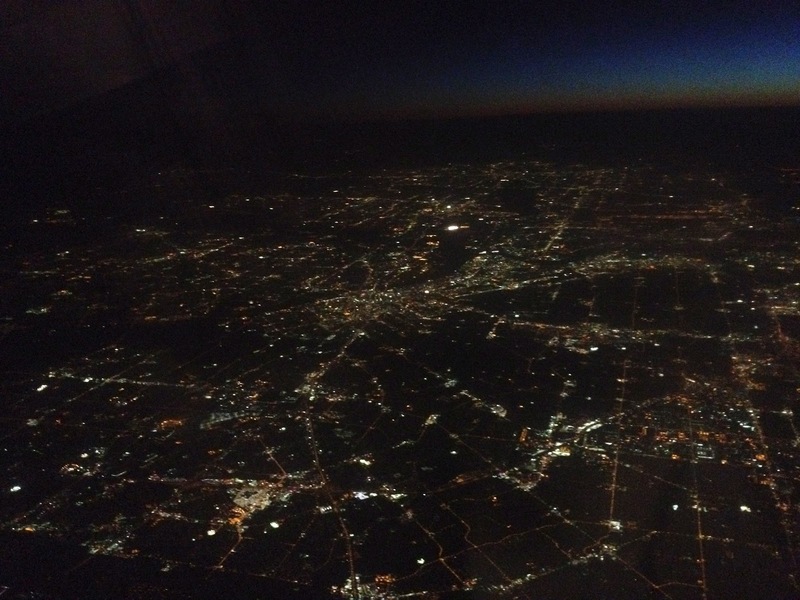 I like it because of the little bit of sky visible from the air. Of course, had United been anywhere close to being on time, I would have see Dallas in broad daylight! ATLANTA -- Most of the victims of last year's epic tornado outbreak in Alabama had at least one thing in common: They knew the storm was coming. With yesterday being the first anniversary of the giant tornado outbreak, many media outlets are reporting a study by the Centers for Disease Control that purports to show that "most" tornado victims were warned. You never know whether this is faulty media reporting or a flawed study. But, since this is being reported in so many places, lets look at the numbers as reported by MSNBC. The CDC has been examining reports of 255 deaths, including a few for which no Alabama death certificate has been found yet. It's possible a few people were injured in Alabama but died in hospitals in nearby states, Chiu said. For 120 of those 255, the CDC determined whether the victims knew of the coming tornadoes ahead of time. And 105 were warned. If 105 were warned out of 255 deaths, that is 41%, hardly a "majority." Put in context, that is a very low number. In the case of the Greensburg, Kansas, tornado in 2007 99% were warned. I suspect the explanation for the low percentage of people knowing the storm was coming was the power failures caused by the two lines of thunderstorms that moved through the region in the hours before the killer tornadoes formed. 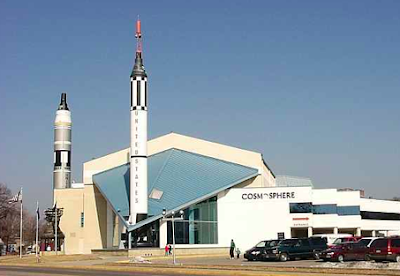 This is the 50th anniversary year of the Kansas Cosmosphere, universally acknowledged as one of the greatest space museums in the world. It doesn't just show off (real) space capsules and memorabilia, it tells their story in a lasting and memorable way. 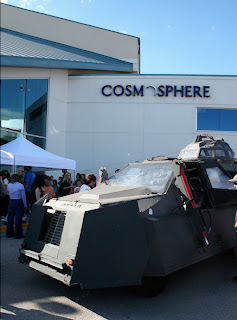 If you have never visited the Cosmosphere, I highly encourage you to plan a visit. I promise you will be impressed. and for inviting me to speak on a number of occasions. I hope the entire Cosmosphere staff will take a moment to to savor what they have accomplished during their first half century. Update: Sunday morning. Coverage of the 50th anniversary celebration from the Hutchinson News. Storm near Auburn with large hail moving rapidly NE toward Topeka. 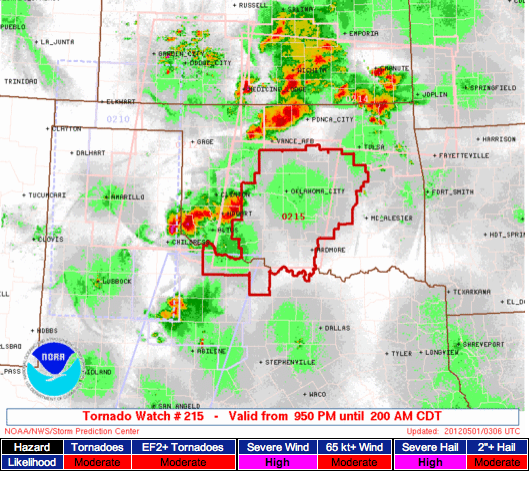 NWS says sufficient rotation for tornado. Last blog post of evening. United Airlines has been an utter mess since its March 3 "merger" with Continental. I'm in Houston dealing with multiple flight problems, so I will not be able to blog about the storms the rest of the evening. I will Tweet them at @usweatherexpert. There are a number of interesting posts below and regular blogging will resume tomorrow. 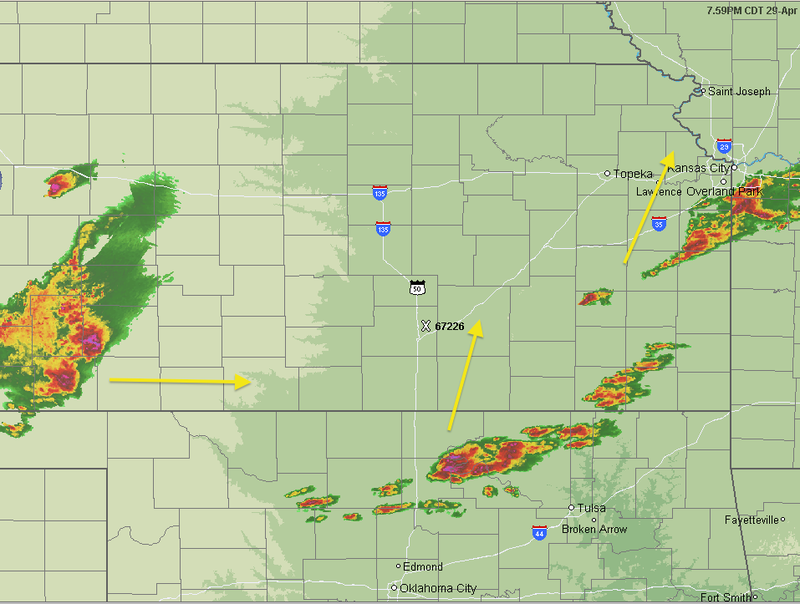 Strong thunderstorms continue from the Flint Hills into north central Kansas. The storm near Alta Vista looks suspicious to me so from there up to Waubaunsee Co. be ready to take safety precautions as it moves NNE to NE. While brief, you'll really enjoy watching this. Hope you can join us in Kansas City the evening of May 9. Details in the video. 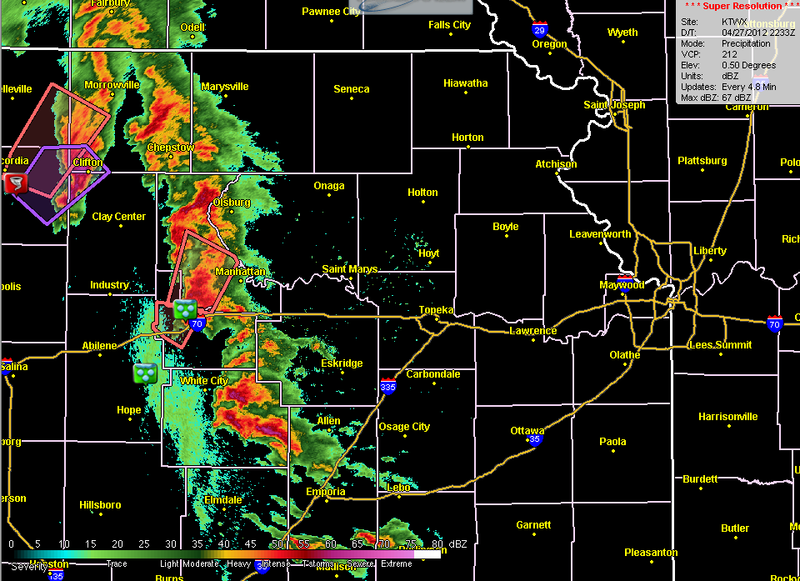 Radar at 4:50pm shows strong tornadoes over north central Kansas moving toward the northeast part of the state. These storms are capable of producing tornadoes and very large hail. 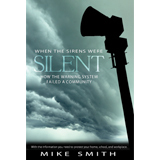 Since we are well into the official tornado season, what better time to read Mike's first book WARNINGS: The True Story of How Science Tamed the Weather (Greenleaf 2010) before his second book When the Sirens Were Silent (Mennonite Press 2012) comes out next week. Amazon has WARNINGS in stock and it holds a 5-Star Rating making it an exciting read about some of the most massive storms of our lifetime. Mike says we have tamed the weather but we still can't control it. 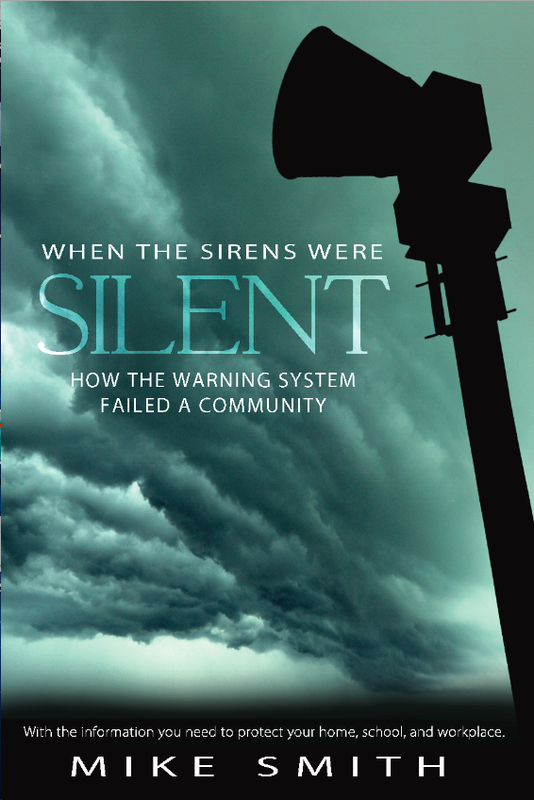 His second book Sirens tells the story inside the storm that devastated Joplin and offers tornado safety rules to keep safe at home, school and in the workplace. Mike's passion is saving lives and it is his mission in life to make people aware of the warning system and how to stay safe in the event of a tornado. 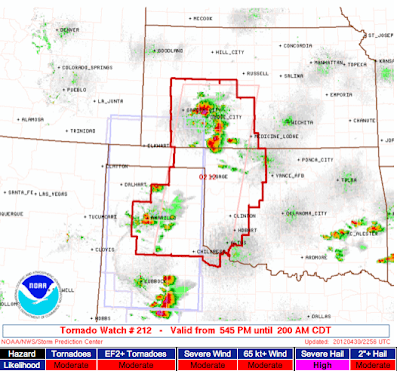 Significant Tornado Risk Builds: Central U.S.
"Weather Tourism and Storm Reporting"
Put Your Cars in the Garage OKC Metro! The Water the Wheat Needed?